VISION ... a name without a pattern. Vision...at this stage we can only guess. 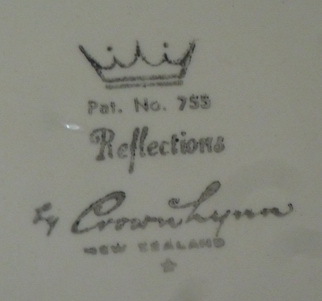 On page 76 of Crown Lynn A New Zealand Icon, Val Monk wrote: (with respect to the Cook & Serve Range) "The first designs were Narvik, Vision, Blue Tango and Green Bamboo." 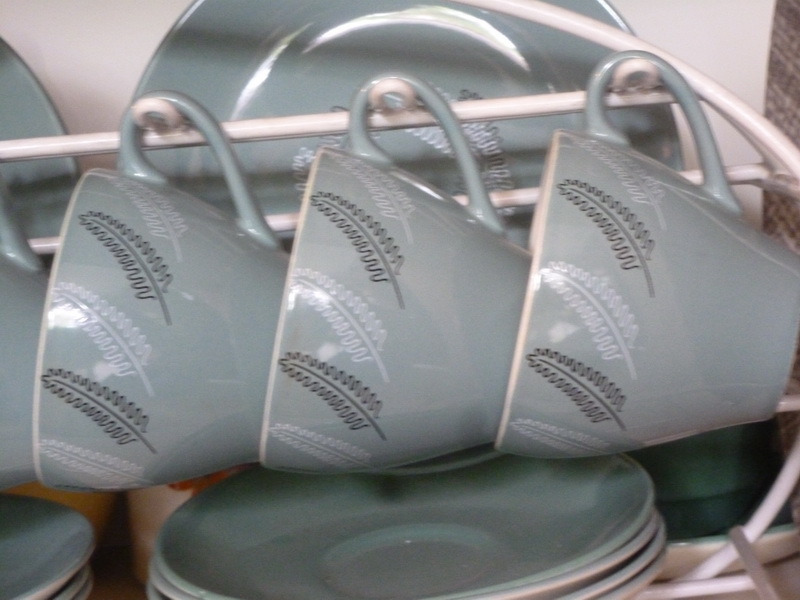 Narvik, Blue Tango and Green Bamboo are old favourites we are all familiar with (and I like many of you have pieces of Crown Lynn in these patterns) BUT WHAT ABOUT VISION? 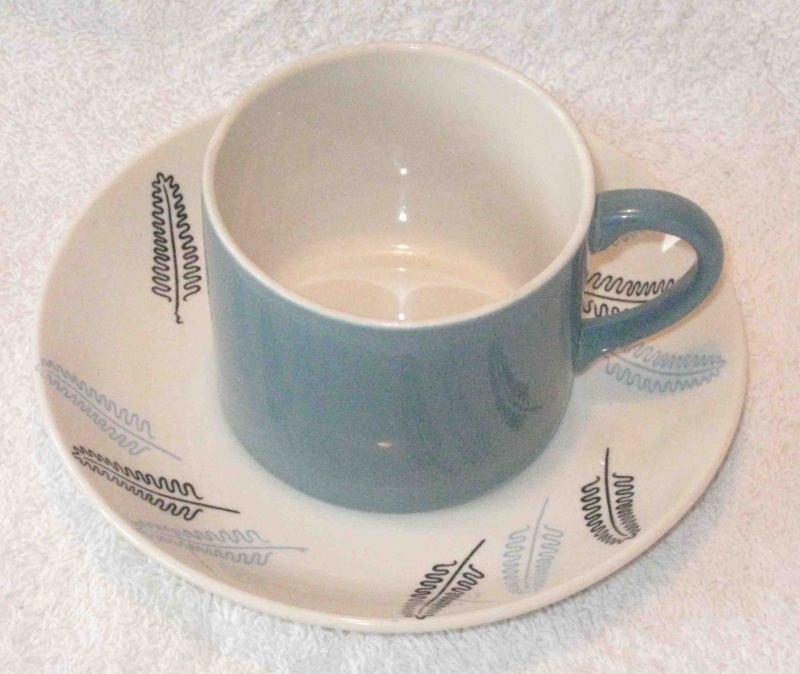 No one has yet produced a piece of Crown Lynn in the "Vision" pattern for the gallery. Did the pattern ever even go into production? I'm looking for answers. The unnamed pattern illustrated is so like Josling's Reflections that there must be some connection. Then again, it is highly unlikely that Josling would enter such a similar design in the following year's competition, and get a second place, so now we are not just looking for a pattern called Vision but also for a further Josling design, which in all likelihood is completely different. ... firstly, can anyone else provide examples of the above design used elsewhere? ... secondly, can anyone provide a pattern without name, SPECIFICALLY ONE THAT WAS USED ON COOK & SERVE FROM THE EARLY 1960s. I am pretty ignorant of most of those patterns, but nothing immediately stands out. I do have one other contender for "Vision" but that would be cheekier than anything else I've seen from Crown Lynn so far. 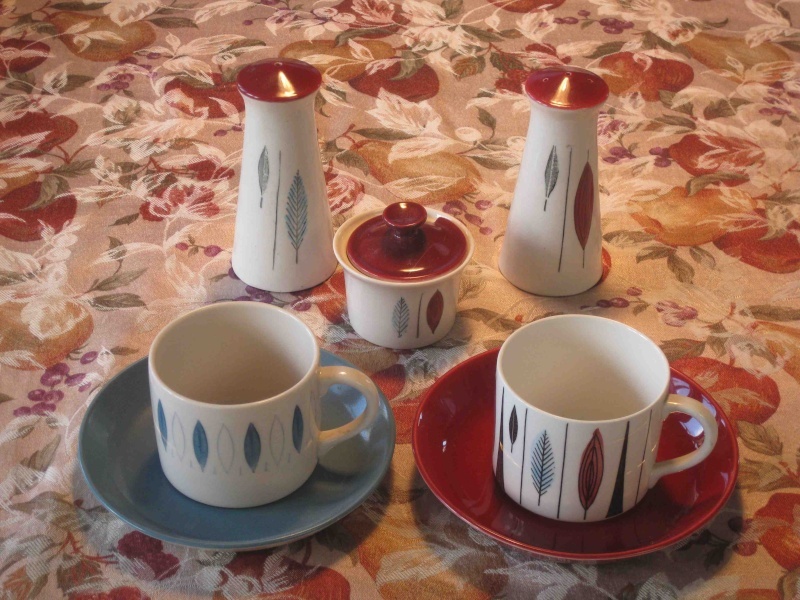 That is, Marianne Westman's "Tango" pattern as seen on Rorstrand Sweden coffee sets. Crown Lynn did use the pattern on Cook and Serve bakeware, on pepper, salt and mustard, and a lidded ramekin, without benefit of a name, but as far as I am aware not on coffee cans. Crown Lynn had its own Tango design, "Blue Tango". I have no idea when Crown Lynn used this pattern, but I suspect it was later rather than sooner. Share your own "Visions" here. Re: VISION ... a name without a pattern. I just happened across a list of Crown Lynn patterns that I found in some scrapbooks from 1966 - 1967 at the Museum Library. These were adverts from magazines and the like, so there was a photo and a name. Mostly there wasn't a number. The good news is that Vision is on the list !!!!!!!!!! I will be checking this out next time I'm at the Museum that's for sure! please be patience , I have some hick ups on how to put the picture on. 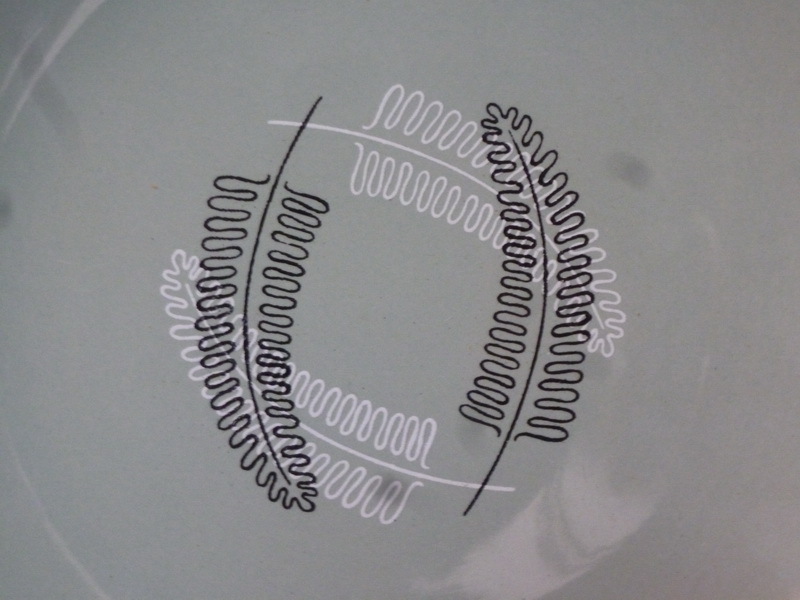 Sideplates have the interwoven ferns design. Finally a picture of Reflections on Teal. Thanks hendelglass. then I have two completely different Reflections cans duos. Jeremy I have checked my reference for the name Vision... see below. I don't have a copy of this edition of NZ Ceramics, it probably came from the Auckland Museum Library. It is weird that we haven't found an example... here's hoping! Vision ... a name and now a pattern! Thanks to Ev for finding a pattern to the name Vision. It is option two: the Rorstrand pattern from their coffee cans. This means that the Crown Lynn coffee can saucer above is not Vision. Following contributions to this topic I will now consider it to be a variation of Reflections pattern 755 as seen on hendelglass's Teal set (rather than 842), although the third colour is definitely blue and not teal. It may yet turn out to have another, third, reflections number.